I’ve known radical grandma Rosemarie Jackowski (RMJ) for several years now and even interviewed her in 2005 about her arrest and court case. In light of her unique story and her tireless commitment to justice, I (and others) have encouraged her to write a book for years. Well, I’m happy to say, RMJ has delivered as only she can with Banned in Vermont. Mickey Z: Why did you write this book? Rosemarie Jackowski: My main purpose was to chip away at some of the misinformation out there. Not only in Vermont, but across the US. For example, many people believe that protesting, or as I prefer to think about it, resistance to the government, is a fun-filled, rowdy experience reminiscent of images of the ’60s. Protests now are different. Much more serious. Right now there are many peace advocates in prison. Recently those who protested at the US School of the Assassins at Fort Benning were convicted. Usually those who are prisoners because of acts of conscience get very little news coverage. They are in reality secret political prisoners. Bradley Manning is a political prisoner—one of the few who has attracted any media attention. 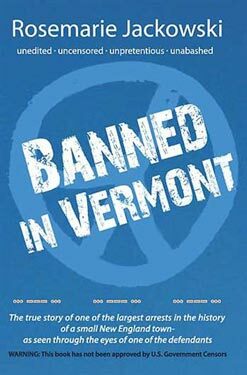 MZ: With all the ground you cover in Banned in Vermont, is there anything you left out? RMJ: Thanks for that question. There are many little secrets hidden in the book. One of them I will leave to the reader’s imagination. It concerns testimony during the sentencing hearing. I refer to this statement on page 20: “…Seems like we were at an impasse.” Imagine being the judge who had to impose my sentence. By this time, the war had become very unpopular. I, on the other hand, was receiving a lot of public support. The press dubbed me ‘The Vermont Peace Grandma’. I had no prior record and even the prosecution admitted that my act of conscience had good intent. It was clear from testimony that my motivation was a love of children and an abhorrence to violence and war. It does appear that I had secured the moral high ground. I expressed my willingness to go to prison. It almost made me feel sorry for the judge who would have to impose a sentence. The undisclosed secret in the book that the reader will have to decide is: Was this checkmating of the system a result of my well-thought-out legal strategy, or was I just lucky in having the events unfold this way? Also, left out of the book was an irrelevant bit of legal trivia. During part of this long process, I had two cases before the Vermont Supreme Court and no lawyer. I don’t think that happens very often, if ever. MZ: What would you like readers to experience while reading your book? RMJ: I hope that readers will experience humor, joy, and sometimes sadness—which can sometimes inspire one to action. One of the most important messages of the book is something that I sprinkled on every page that I could. That is the Madeleine Albright’s admission that the USA killed 500,000+ Iraqi children and she thought that the price was worth it. I remember seeing that interview with Leslie Stahl on 60 Minutes way back in 1996. My immediate reaction was, ‘finally’. Now the sleeping US conscience would be awakened. I was wrong. The lack of empathy for victims of US foreign policy is mindboggling. How can that be explained? One other important message in the book concerns the Black Budget. I pose the question: Has every election since 1947 been illegal? The Black Budget was authorized in 1947. How can those elections be legal if no informed votes were cast? If you can’t follow the money, you can’t know what your secret government is doing. Too many believe that if all uniformed members of the military were brought home, the killing would end. It is clear that more have died because of actions of the State Dept., CIA, private contractors, etc. etc, etc. In actuality, the uniformed military is only the tip of the iceberg. The real danger is with the secret US forces. MZ: Should we expect another book from you soon? RMJ: Not on my very old computer. Unfortunately, writing does not pay. Most authors that I know, even the really great ones, are struggling. I expect to make less than zero money on this book. MZ: In light of the current rhetoric, do you feel there’s any “hope”? RMJ: Not until US citizens change. That will require a change in almost everything—from the way US history is taught in schools, to the way information is disseminated to the general public. Just last night, I was talking with a friend who is a high-ranking administrator in the educational system. He has a copy of my book and said that there was a good chance that it would be banned in school libraries. On the other hand, I have already been invited to speak to a college class.